Out of all the teams with a realistic shot of making the NBA Finals, the Philadelphia 76ers were always the one team that had the smallest margin for error. There were plenty of reasons for that: Joel Embiid’s balky knee, first and foremost. A concerning lack of depth after two big midseason trades (for Jimmy Butler and Tobias Harris) that depleted their reserves. Major issues with floor-spacing (looking at you, Ben Simmons). And also that the 76ers have as much pressure on their shoulders as team after general manager Elton Brand sped up The Process to obtain two star players who will be unrestricted free agents at the end of this season. The mentality was to go deep in the playoffs this season and make Philly an even more attractive place to be next season: For Butler, or for Harris, for both, or maybe for others. Now let’s not overreact to the 76ers dropping the first game of the NBA playoffs on Saturday to the deep, balanced, impressive Brooklyn Nets. This is not a five-alarm fire for the 76ers — not yet. The 76ers still have the four most talented players on the floor in this series. They still have a starting five in Embiid, Butler, Harris, Simmons and J.J. Redick that has statistically been one of the NBA’s best this season despite limited minutes together. But Saturday’s loss illustrated exactly how small a margin of error the Sixers have. And if you’re going to pick a loss to overreact to, well, Saturday’s performances by every 76er except Butler gives you plenty of material to work with. The single most important thing for the Sixers is, on Saturday and on any day, the health of Embiid. 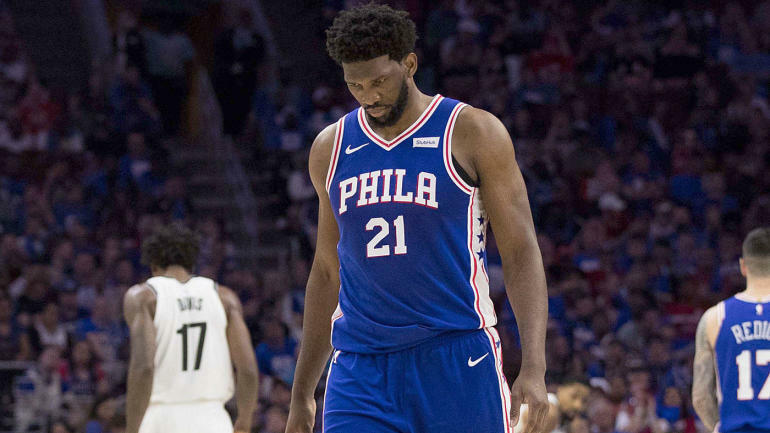 The day before the game, Embiid was downgraded to doubtful because of pain in his knee when he jumped and when he landed, and he told reporters that he had “no idea” whether he’d play in Game 1. It wasn’t announced until minutes before the game on Saturday that he would in fact play. One of the problems with the Sixers is that they couldn’t afford to rest Embiid on Saturday; they’re more than 11 points per 100 possessions better when Embiid is on the floor, and his replacements – Boban Marjanovic, Jonah Bolden, Amir Johnson – are all major drop-offs. So Embiid did play, and he looked like a guy who probably shouldn’t have. He was slow getting down the court. In the first half he launched 3-pointers — missing all five of them — instead of being aggressive. He finished with 22 points and 15 rebounds, but those aren’t the key numbers. The key numbers are that Embiid only played 24 minutes, and in those 24 minutes, the 76ers were outscored by 17 points. But the Sixers could have weathered a rough game from their star. If only the rest of the team had shown up. Simmons in particular was terrible, with his lack of outside shooting again limiting his game. He scored nine points on only nine shots, and he missed four of his five free throws. Simmons had a team-worst plus-minus of -21, a mark that was equaled by Redick. Redick had another rough playoff appearance — he’s a 41.3 percent career 3-point shooter in the regular season but a 36.3 percent 3-point shooter in the playoffs — scoring only five points before fouling out. And you could be forgiven on Saturday if you forgot Harris even played for the Sixers, as he was nearly invisible, putting up only seven shots (in 41 minutes) and scoring only four points. The Nets were up 17 points in their first half despite Butler locking down D’Angelo Russell for the first 24 minutes of the game. The biggest problem with the 76ers isn’t that they’re a strangely constructed roster for today’s NBA. They certainly are that, but at their best, they are a team that can contend for a title, odd roster be damned. The biggest problem with the 76ers is that everything has to go right for them to be at their best. In the East, the Raptors have margin for error; they’re a balanced team that can trot out lots of different looks. The Bucks and the Celtics have margin for error, too, because of their depth. The 76ers don’t have that sort of margin. It’s not time to panic. Not yet. It’s only one loss in a best-of-seven series. But on Saturday, the 76ers margin for error showed itself. It also got a little bit smaller.